Back in the mid 1800’s John Blake developed the Blake’s Hydram. 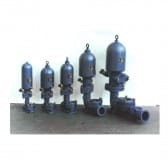 It is a hydraulic ram pump that uses nothing but the force of the water flowing down the “drive pipe” to lift water to a maximum height above the hydram of 150 meters. There is no need for any external source of power, making it possibly one of the most inexpensive methods of raising water in the world. A hydram water pump is a simple and easy to maintain, having only 2 moving parts, both being little more than oversized tap washers. The Blake hydram water pump is very robust and long lasting. We have many customers that have had non-stop service from their hydram pump since the 1920’s and 30’s and we are aware of one customer who has a working hydram that was manufactured in 1884. Who knows how much water that hydram has pumped in the over 140 years it has been working away day and night? For information on how to select or maintain your hydram pump please click the product image below.